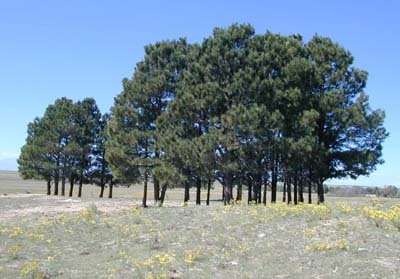 No markers remain at this burial ground located in a grove of pine trees at the southeast corner of Scott and McClelland Road in eastern El Paso County. To reach the site, from Colorado Springs drive east on Highway 24 past Peyton. Turn right at McClelland Road. Proceed two miles south past Scott Road, and the grove is close to the road on the left about a tenth of a mile past the intersection of Scott and McClelland. According to GPS-derived geolocation (accurate to within 10 meters), the site's coordinates are latitude 38°59'48.0"N and longitude 104°24'13.3"W. For permission to access the site, contact owner Norma Scott, 22692 Scott Road, Calhan, CO 80808. The trees were planted by John Scott, father of Norma Scott, after a 1965 flood threatened to wash out the burials. The graves were there when he bought the land in the mid-1930s and they are said to be those of an older man and a baby of a hired hand. The Scott sisters remember family members coming to visit the graves until about 1990. They also believe the baby could be the burial erroneously labeled "Scott Grave" in the Colorado Cemetery Directory, as they know of no little girl Scott buried on what was formerly their father's land. A neighbor, Florence Pohlson, recalls hearing that four or five members of the Redmond family are buried here. The Directory says the graves here were possibly burials of the Redmond family that owned the land about 1903. On March 2, 1907, son James Redmond quitclaimed rights to the land to John F. Mullaney. The document names all ten of Caroline's heirs: sons James, Peter, Thomas, Edward J., Sylvester, and Joseph Redmond and daughters Maud M. Piper, Nellie Lehman, Margaret Lorraine, and Loretto Finley. (6) Mullaney and his estate continued to own the quarter section with some interruptions until it was deeded to John and Kathryn Scott. It's very likely that the older man said to be buried here is Caroline's husband, William Redmond, an Irish immigrant who died before June 1900. There is no record of an obituary for him in the Gazette index, nor is there a burial record for him in the Evergreen Cemetery index. 1. William Redmond entry, GLO Tract Book, Section 24, T12S R63W, page 140 (microfiche sheet 2), Bureau of Land Management, Lakewood, Colo.
2. Caroline Redmond household, 1900 U.S. Census, El Paso County, Colo., population schedule, Peyton district, ED 20, sheet 4, line 31. 3. Caroline Redmond homestead patent, Book 350, page 107, El Paso County recorder's office, Colorado Springs, Colo.
4. Caroline Redmond obituary, Colorado Springs Gazette, Colorado Springs, Colo., November 16, 1903, page 8, column 1 (page is incorrectly printed November 17). 5. Athlyn Luzier, compiler, Evergreen Cemetery Records (Colorado Springs, Colo.: Pikes Peak Genealogical Society, 1993). 6. James Redmond quitclaim deed, Book 433, page 409, El Paso County recorder's office, Colorado Springs, Colo.